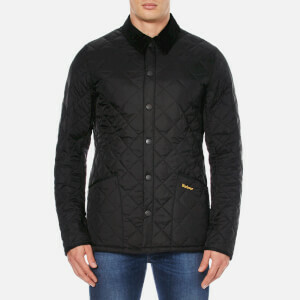 The men's 'Heritage Liddesdale' quilted jacket from Barbour combines classic styling with urban practicality. Crafted from lightweight, wind-resistant fabric with signature diamond quilting and a corduroy collar. A classic press stud fastening secures the slim fit design shut whilst a durable nylon internal provides exceptional warmth. Complete with two patch pockets to the hips with Barbour branding and press stud vent to the reverse. - K.N.